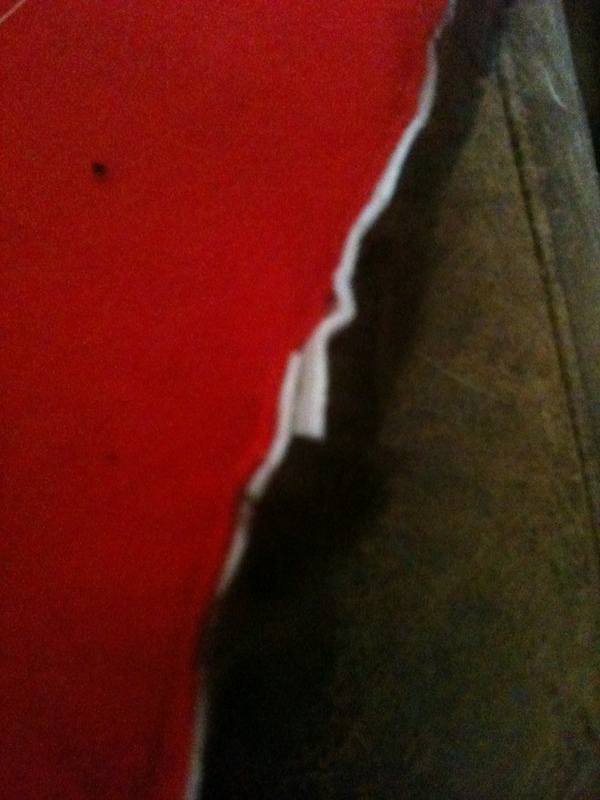 With a working sewing machine these were actually pretty straightforward. So much so that I thought I’d have my first attempt at a tutorial 🙂 My methods are kind of vague but that’s okay as all monsters are different. 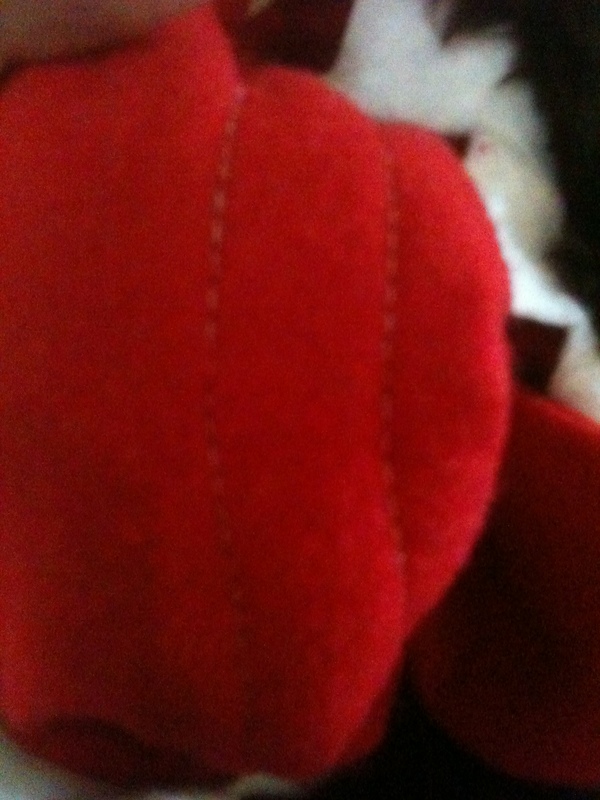 Start with matching rectangles of fur and lining material (I used red felt). 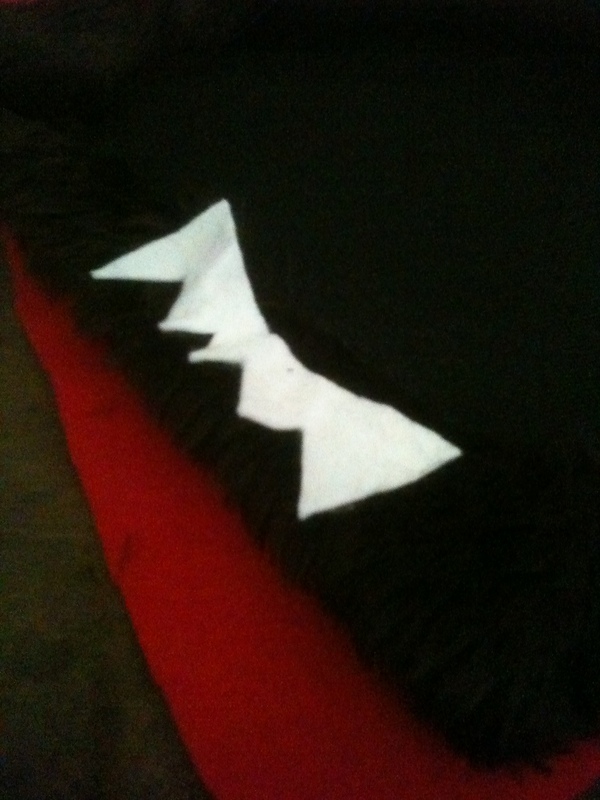 You’ll also want some triangles of white felt and a pair of safety eyes. First you need to stitch together the different layers at the top edge – fur, lining and teeth – the fur needs to face inwards with the teeth between the fur side and the lining. Make sure you leave a gap in the fur for the drawstring – It wants to be close to the top but far enough back that it won’t stop you inserting the eyes. Two to three inches should do it. 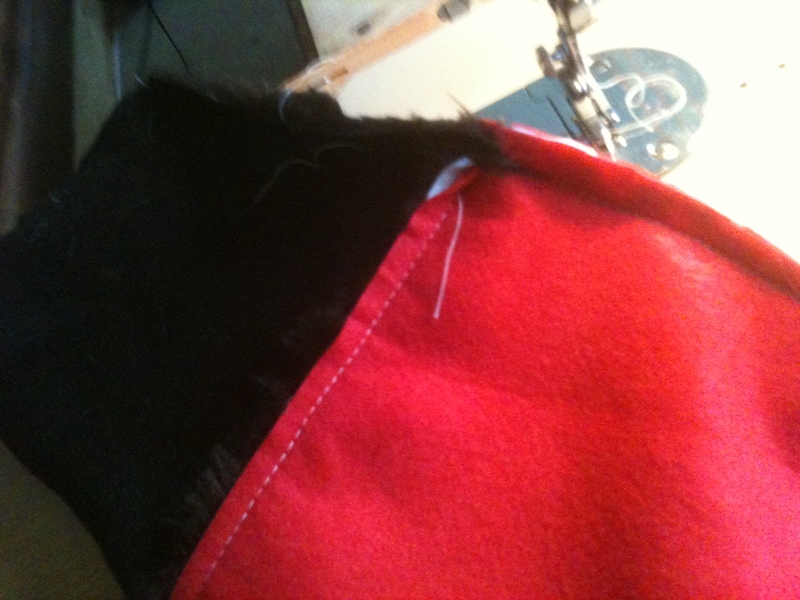 Flatten out the tube and sew up the fur end. 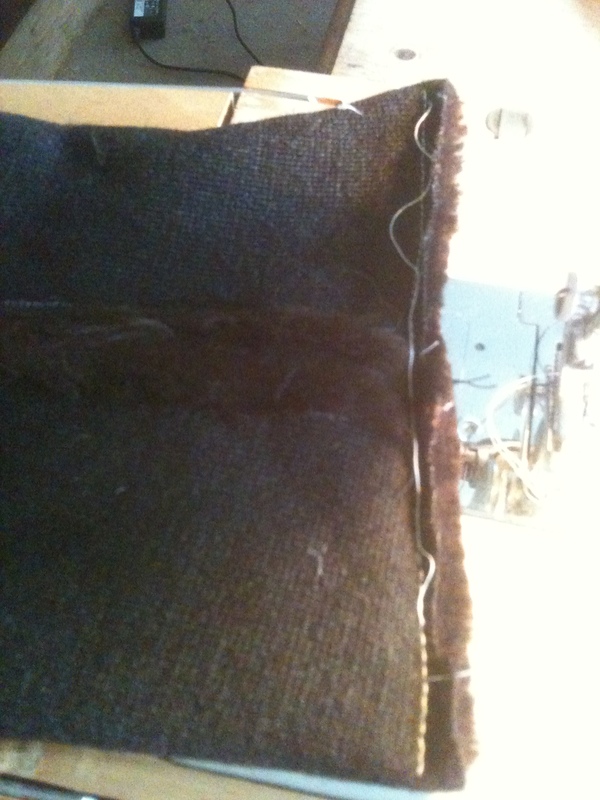 I put the seam in the middle because I liked it that way but you could leave it to one side just as easily. Then you need to add in your eyes – they want to be about an inch or so apart and close to the teeth edge. I added circles of felt around mine as they looked a bit too small. I forgot to take a photo of this part, bu you can see the placement on the finished bags. The rows of stitching should be either side of the gap you left in the fur – just poke a finger through to see where it starts and finishes. 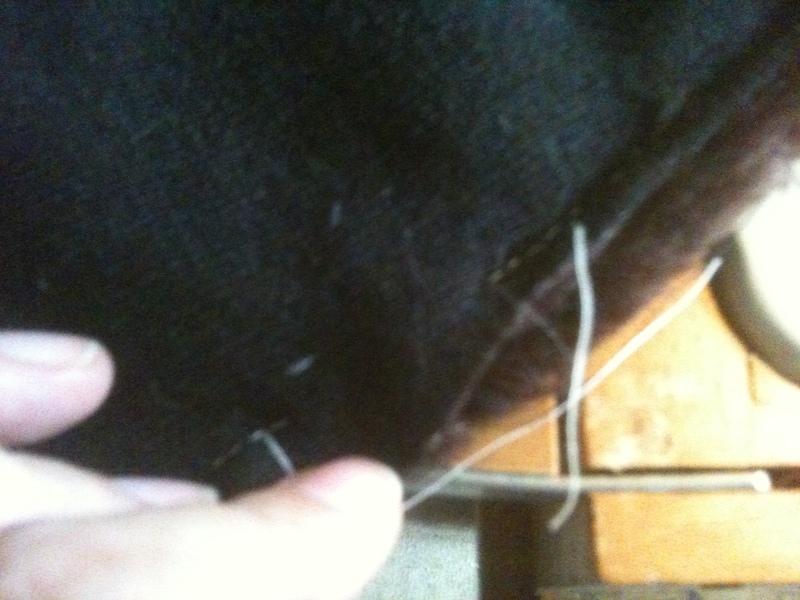 Thread some cord through and if you want to, add knots or toggles to stop it coming back out again. 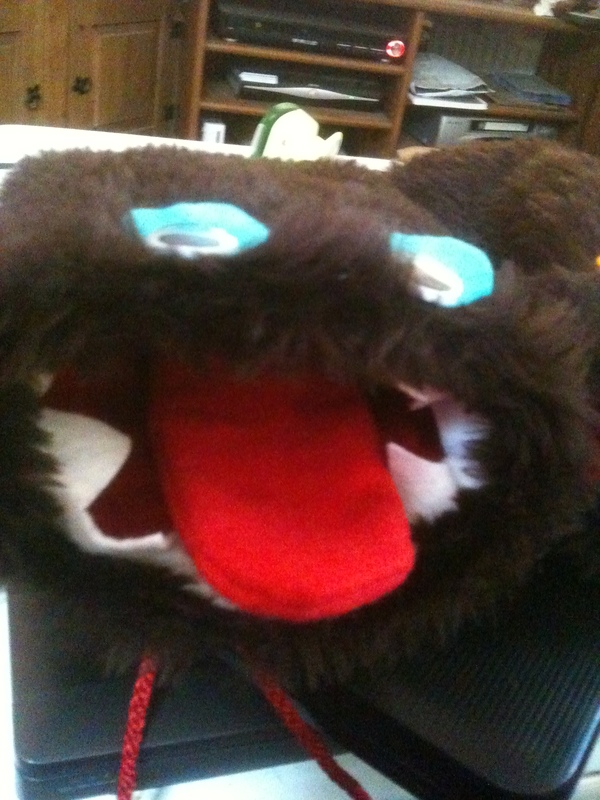 And that’s it – one monster ready to eat your dice 🙂 I also made a tongue shaped pouch to hold pencils which attaches inside with a piece of stick on velcro but that’s completely optional. I’ve ordered some different colours of fur so I can make more of these, they’re such fun! Oh dear. 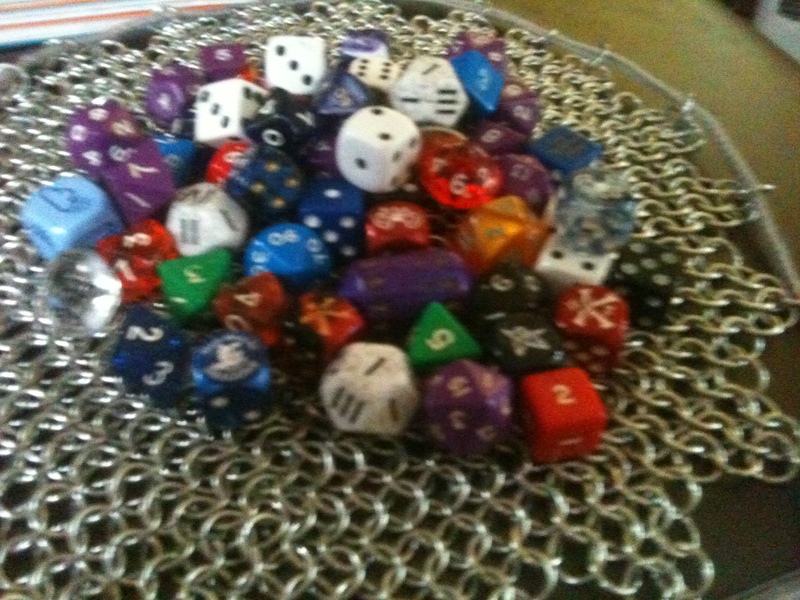 My attempts at making the monster dice bag have so far been disastrous. It started ok – I worked out my plan of attack, found fur fabric and red and white felt, cut them to the appropriate sizes, got some googly eyes I’d purchased from ebay and was all set to go. 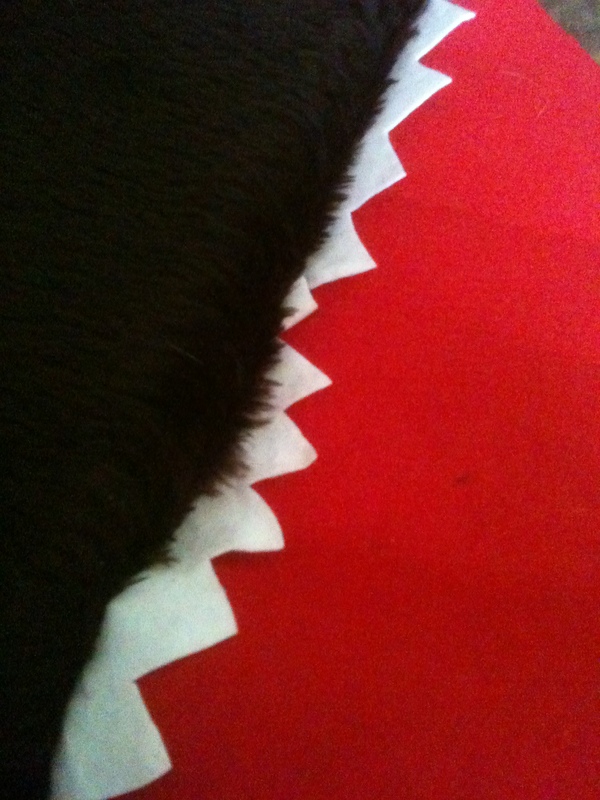 It should be a fairly straight forward make, just sandwich white felt teeth between the fur and the red felt lining. Sew that together then seam the whole lot into a tube, close the fur end and most of the felt end, turn right side out and add in the eyes and a tube for the drawstring – should be done in half an hour. 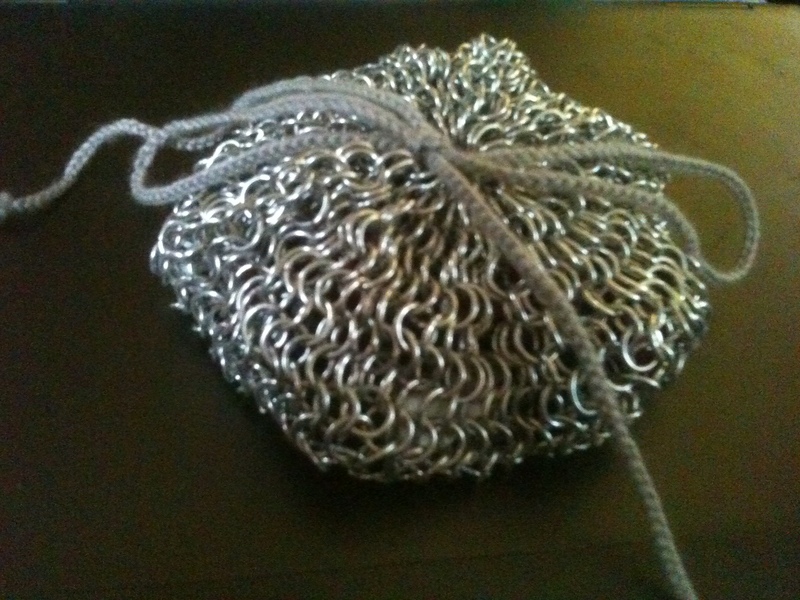 I’d even worked out plans for a removable tongue that would double as a mini pouch for pencils or special dice. Looking good. Gary dug out the sewing machine for me from where it had been stashed when we moved here over a year ago (How can it have been so long?) and that’s where the problems started. First step should have been to wind a bobbin of appropriately coloured thread – but when I removed the housing there was no bobbin in the machine. And of course the box of accessories was nowhere to be found. So we jumped in the car and drove to the nearest haberdashery which had exactly one pack of bobbins on sale. So I bought those, some velcro, some snap fasteners and some cord and toggles and we came home again – only to find that the bobbins were the wrong size so we hadn’t solved the problem at all. I then tried plan B which was to try and borrow one. Dawn had a couple lurking in the depths of her sewing box which turned out to be a reasonable fit so all was looking good – until I’d threaded the damn machine at which point I realised the foot was missing so it wouldn’t work anyway. Gah! 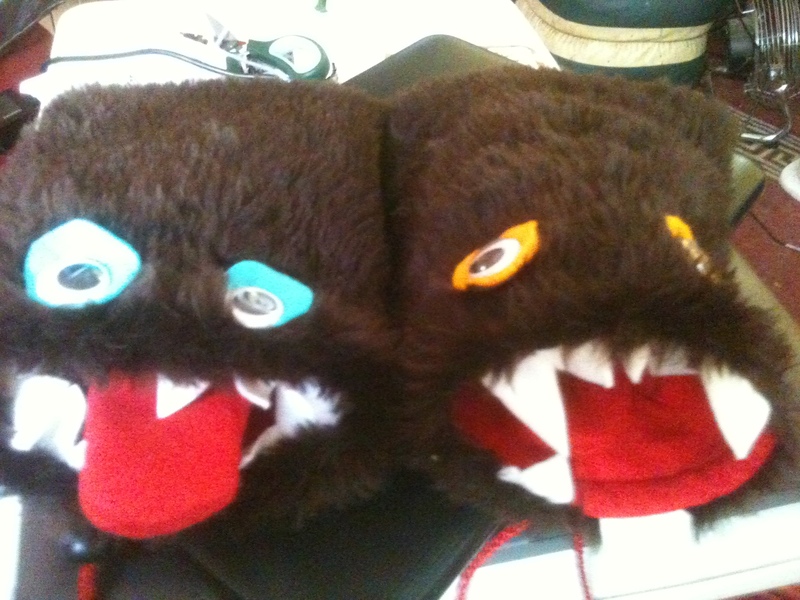 I am going to have a try at making furry monster dice bags. Gary wants one and if I make a couple one can be donated to the raffle at Contraption to help the lovely Chris buy Raspberry Pis for the school that Jack goes to. 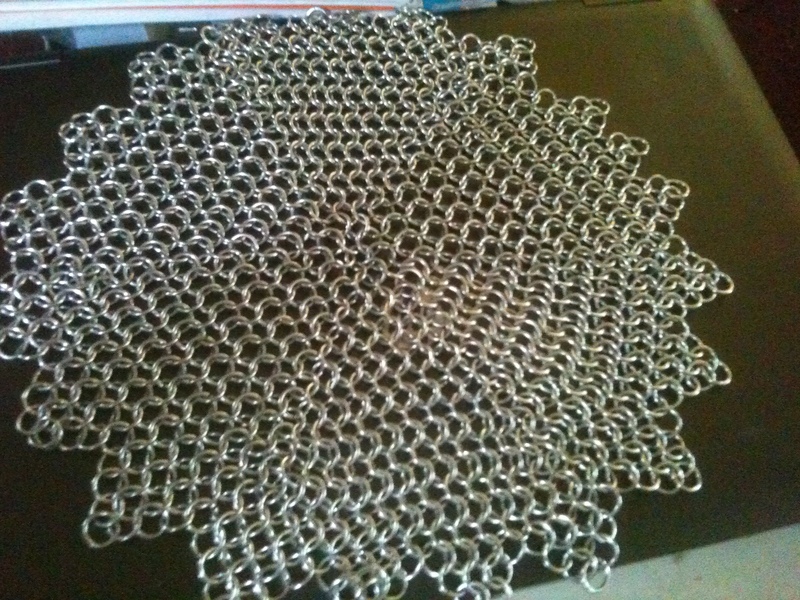 I don’t have a pattern so will be making it up as I go along. 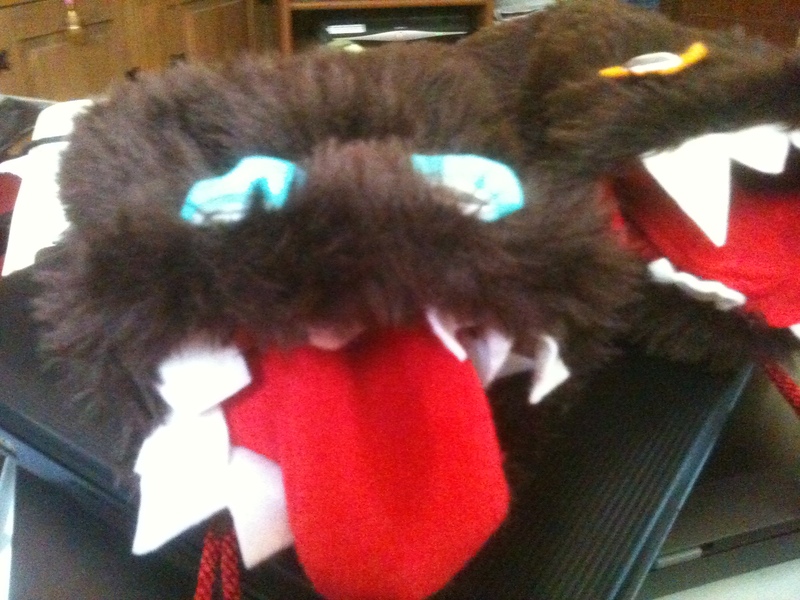 It should be easy enough though, just a simple drawstring bag, fur on the outside, red on the inside, teeth around the edge. Maybe with a tongue to loll around inside.